Length: 4 hrs. 7 min. Having a life-threatening illness is a constant reminder that today is precious. 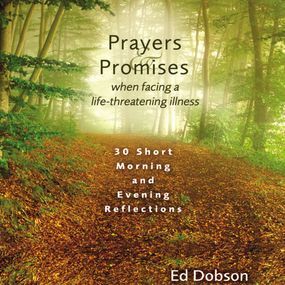 Prayers and Promises When Facing a Life-Threatening Illness offers encouragement and hope to those who suffer and those who love and care for them. Written by a fellow pilgrim on his own journey with Lou Gehrig’s disease, this powerful and inspiring devotional guide offers thirty short reflections to nurture your faith and boost your strength.Each reflection is a small dose of spiritual truth to start or complete your day. Morning selections include a brief prayer and reflection. Evening readings are based on God’s promises to encourage and enlighten you. Some of the prayers and promises include:• God, remind me that there is more to life than this disease.• God, give me strength to believe that you can heal me.• God, give me something to laugh about.• God, help me to leave a legacy for my family.• God, I don’t feel like praying.After completing the thirty-day cycle, Dr. Dobson encourages you to repeat it again and again for continued spiritual nourishment that is needed during this time.